· Enjoy live music while you stroll in the open-air mall, see electric cars and visit booths that showcase businesses and non-profits which offer sustainable products and services. · Meet members of the Blue Ridge EV Club & join up for free! · Explore the new Asheville Outlets and one of close to 75 stores. Enjoy a meal in the food court and spend the afternoon. Come out and see for yourself why Electric Vehicle sales have been skyrocketing. Please register now to attend for free. 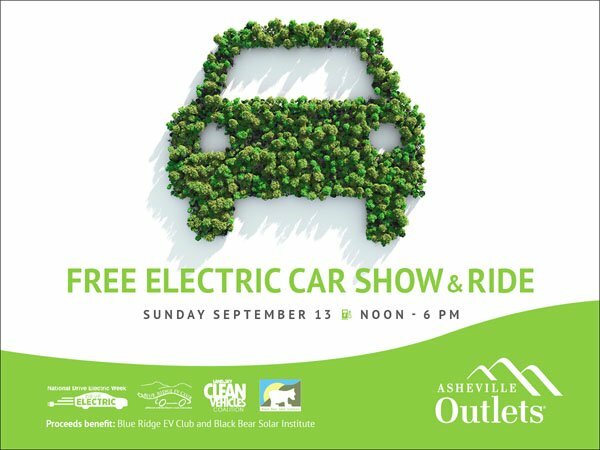 During the week before and after the event (September 7 - September 20), see the latest models of electric vehicles on display at the mall (based on dealer inventory & availability).